Social media influencers are individuals who have “greater than average reach or impact through word of mouth in a relevant marketplace” as defined by the Word of Mouth Marketing Association (WOMMA). They’re important to marketers because their opinions sway other people including social media participants and drive the social media conversation. To better understand the role of influencers on social media and the marketplace in general, Technorati Media gathered input from over 6,000 influencers for their 2013 Digital Influence Report. Here are their top five findings. 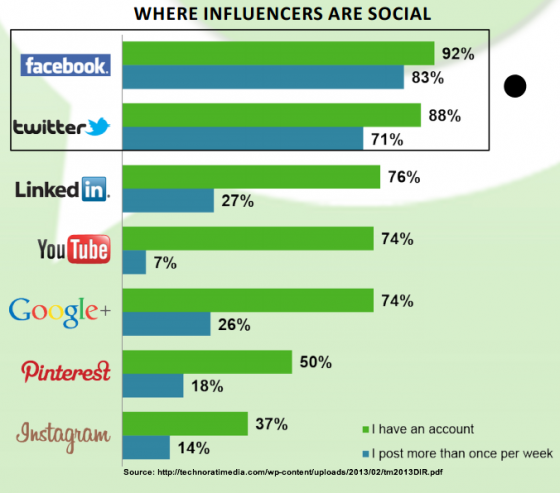 Influencers have a presence across the top social media platforms in that they have accounts on one or more services. This makes obvious sense since it’s critical to stake your turf whether you’re an influencer, brand or individual. 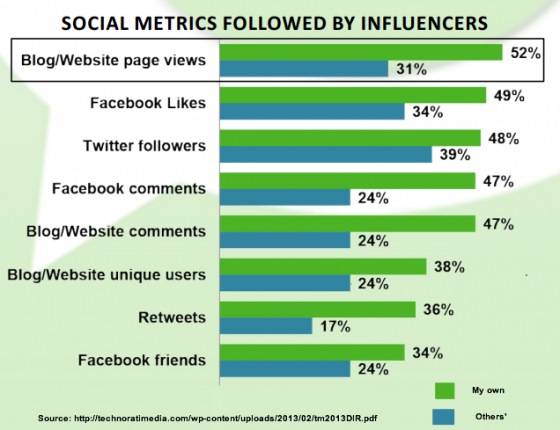 Influencers are most active on Facebook (83%) and Twitter (71%). Not surprising, given the size and ease of sharing links on these platforms. Lackluster sharing on LinkedIn (27%) and Google+ (26%). This is surprising given that they don’t require the same time commitment as Facebook and Twitter. Tumblr’s absent from this research. This also is surprising since it’s a top-ten social media site and it’s a form of blogging. Actionable marketing tips: Marketers should take a cue from influencers and ensure that they’ve built their profile on all relevant social media platforms. Further, they should test to determine where their audience is most active. While size is an important reason for using Facebook, don’t underestimate the power of Google+ and LinkedIn, especially for B2B marketing. This makes sense since blogs are among the oldest of the current forms of social media. 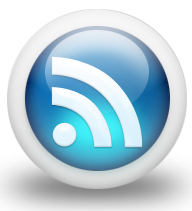 With little or no cost, a blog provides a media platform that can distribute content in a variety of formats. You no longer need to work your way through an existing hierarchy to get your ideas published. 88% of influencers blog for themselves. 5% have five or more blogs. 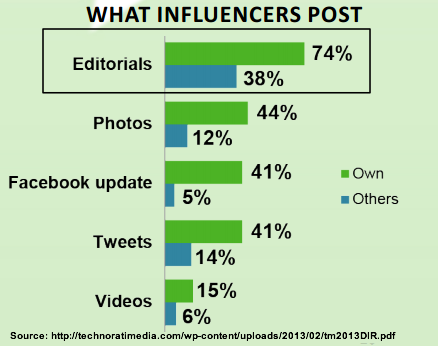 59% of influencers use a blog as their primary publishing platform. These points make sense because every influencer is out to build their own brand and establish authority in their niche. Just as you would with any media entity, expect to compensate an influencer for being associated with your brand. Actionable marketing tips: Influencers, like traditional print media, have solid audiences that read their content because they appreciate the point of view and the information delivered. As a marketer, you can leverage their audience to distribute, reinforce and add value to your brand. As bloggers, most influencers create text information as well as linking to other writing. They understand the power of quality content marketing and how it’s essential to social media interactions. 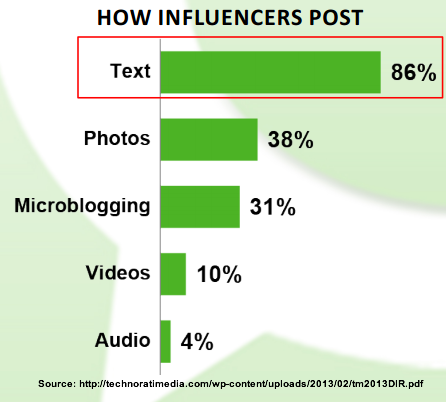 84% of influencers write text posts. Bloggers are facile writers who have built up their blogging habits over time. 38% of influencers post photographs. While many bloggers add an image or photograph to a written article to lure readers in, about three out of eight post photographs. Given the ease of taking and sharing photos with smartphones, many of these photographs end up on image-friendly tumblrs and Instagram. Expect this form of content creation and use to increase. 10% of influencers post video. Despite the power of video for conveying a message, it’s expensive to do professionally relative to other content formats. 4% of influencers use audio. To-date, personal audio has yet to take off but don’t wait if you’re looking to build a following because influencers are building their platforms. 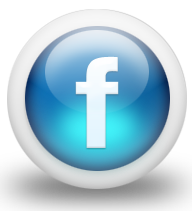 One high visibility social media expert doing so is Mike Stelzner of Social Media Examiner who has a weekly podcast. He believes that the growth in personal devices will lead to growth in audio since it’s a great background medium. Actionable marketing tips: Build your blog as the hub of your content marketing. Chris Brogan calls it your social media home base. While text dominates among influencers, underestimate photos at your own peril because they’re easy to take and share. 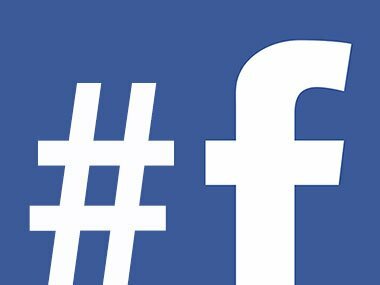 In fact, Facebook is the largest source of photographs. 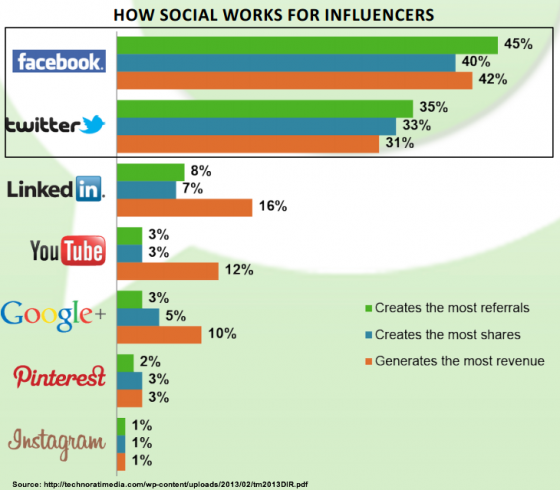 For influencers, social media yields referrals, shares and revenues. As the most used sites, it’s no surprise that Facebook and Twitter yield the most results. But proportionately, when you take into consideration their usage (see Finding 1,) LinkedIn, YouTube and Google+ are significantly more effective. Influencers monitor the effectiveness of their work. 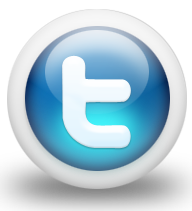 They’re pros at optimizing every aspect of their social media efforts to maximize their revenue flow. This is particularly important since many of them are entrepreneurs whose future is dependent on their earnings. What’s surprising is that there’s no mention of revenues or email addresses in Technorati research. These are the hot buzzwords at affiliate conferences where attendees are laser-focused on revenue generation and performance. 52% of influencers track pageviews. 38% of influencers track unique visitors. Actionable marketing tips: Marketers must track social media results beyond Likes and Shares because these activities don’t necessarily translate to the bottom line results. If you don’t set out to measure activity that leads to sales, you won’t get there. You must include a call-to-action and have tailored landing pages. Social media influencers matter to marketers not only in their capacity to sway opinion about brands, products and businesses, but also in terms of being a model for how to use social media effectively. This is the most common type of influencer. Everyone has a specialty... let's say it was bikes: You rode a lot of bikes and you read a lot of articles about bikes. You knew what kinds of bikes and brands of bikes were right for different uses and people knew that about you. Fairly often, people would ask for your advice on what bike to buy. You were a counselor - You never posted up your opinion or even rated products online. Rather, you were simply a resource that your friends (and their friends) knew was available, when they needed it. How to connect with counselors: The best way to connect with counselors is to not try too hard. You simply need to put your content out in places where it will be seen by them: on popular blogs, through your own site, and in editorial content. They will find it, because they are seeking this information out. The big challenge for marketers is that the recommendations that counselors make are not public - they get emails (or DMs) and respond back personally. As a marketer, you simply have to trust that your messages are good, your content is high quality, and that you are reaching the right people. The second most common influencer is the communicator. These are people who not only have a large storehouse of knowledge about a subject but are actively seeking out opportunities to share that knowledge. They are the bloggers and (more commonly) the commenters and raters of products online. They are the people who go to forums and start discussions or immediately head to online review sites the moment they experience a product. For them, the sharing of an experience is part of the experience itself. How to connect with communicators: The best thing about communicators is that they are so easy to find. Use search tools or buzz monitoring apps to locate the people who are posting frequently on sites and in forums. The way to connect with these people is to have someone from the brand actively participate in forums and on discussion lists. Follow all the protocols of letting the world know that you are an official voice of the brand and invite these people into discussions. The rarest (and therefore most valuable) of the influencer set is the community builder. This is the person who not only has lots of information and likes to share it, but has taken the steps to gather other people around her ideas. Community builders start blogs and launch forums. They become moderators on sites like Reddit. They believe that they can do good by creating and managing spaces that are focused on particular ideas, topics, or causes. They can be the most influential simply because they have the greatest reach and the most visible platforms. How to connect with community builders: The only real way to do this is to settle in for the long haul. The people who are most successful at connecting with community builders are not marketers, actually, but PR professionals. This is all about generating relationships where the community builder is given information or access to products. The PR people need to know the community builder by name and have them on speed dial. You don't get access to these valuable people by sending a mass email. So, find the ones who you really want to connect with and treat them like, well, people you want a relationship with. Build slowly and always through respect and value.